The fish truck delivers to J&N Feed this month. Looking for pond stocking in Graham, Texas? The Stock My Pond and Abney’s Fish Truck will make deliveries to J&N Feed and Seed this month. 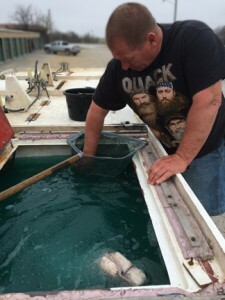 Wednesday, April 3, 2019, from 2:00 to 3:00 p.m.
Friday, April 19, 2019, from 4:00 to 5:00 p.m.
Stock My Pond Fish Truck will have channel cat, largemouth bass, black crappie, bluegill, hybrid bluegill, red ear bream, and fathead minnows. Click here for pricing. It is not necessary to pre-order the fish, but if you are looking for a large quantity or pond packages we suggest you call. Questions? Call Stock My Pond at 501-676-3768. Abney’s Fish Truck will have channel cat, largemouth bass, black crappie, bluegill, hybrid bluegill, red ear bream, and fathead minnows. Click here for pricing. It is not necessary to pre-order the fish, but if you are looking for a large quantity we suggest you call. Questions? Give us a call at 940-549-4631. Stock My Pond and Abney’s Fish truck provides containers for all fish but the 11″ channel cats, so please bring your own containers for them. How long can the fish be in the bag? No longer than 1 hour! Determine how far a drive you have before purchasing your fish. Transport the fish in a cool and shaded area of your vehicle. This entry was posted on Tuesday, March 5th, 2019 at 10:48 am	and is filed under News & Updates. You can follow any responses to this entry through the RSS 2.0 feed. Both comments and pings are currently closed.